Electronics expo is an online store which offers a wide selection of high quality, high-end electronics. It is known for providing the best brands in the industry at the best rates. Customers have given it an overall excellent rating for providing easy online transactions and quality merchandise. $21.94 OFF Panasonic HDC-TM90K 3D Compatible Camcorder with 16GB Internal Flash Memory; now for $386.99 with code: LSDA1031 through 11.7.11 or later. Additional 10% off purchase site-wide. Up to 30% Off XBOX 360 Accessories. Ends 1/1/2017. Save 53% on the Logitech Wireless Headset F540 with Stereo Game Audio at ElectronicsExpo.com! REG. $149 SALE $69.97 when you use coupon BACKTOSCHOOL12 at checkout. Save 41% on the LG NB3520A 300W Sound Bar with Wireless Subwoofer at ElectronicsExpo.com! REG. $329 SALE $192 when you use coupon BACKTOSCHOOL12 at checkout. Get 10% Instant Cash Back. Expires on 07/31/2015. SMS Audio SMS-EB-SPRT-PNK STREET by 50 In-Ear Wired Sport- Pink for $39.95 + Free Shipping originally $79.99. Expires on 01/05/2015. Save up to 70% on Weatherproof outdoor Bluetooth speakers and Headphones. 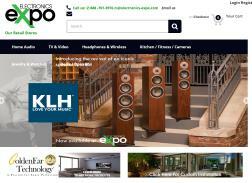 Get up to 50% Off Klipsch. Get Sennheiser HD201 Lightweight Over-Ear Binaural Headphones for $17.97 + Free Shipping. Expires on 12/18/2014. Save 90% on the Philips DLN1732 Folio Style Case with Stand for iPad at ElectronicsExpo.com! REG. $19.99 SALE $2 when you use coupon BACKTOSCHOOL12 at checkout. Get up to 70% off during Black Friday Sale. Up to 30% Off Nintendo Wii Accessories. Ends 1/1/2017. Save 38% on the Sharp LC-32D59U 32 720p LCD TV HDTV NEW at ElectronicsExpo.com! REG. $399 SALE $244.8 when you use coupon BACKTOSCHOOL12 at checkout. Save 47% on the Boston Acoustics TVee Model 25 Sound System with Sleek Sound Bar and Wireless Su at ElectronicsExpo.com! REG. $349 SALE $184.7 when you use coupon BACKTOSCHOOL12 at checkout.